Warren Dotz collects the stuff most people treat like garbage. In years past, he’s gravitated to the noisy graphics of firecracker wrappers printed in places as far-flung as Macau and Manila, as well as the vividly illustrated, deity-drenched matchbox covers of India. These paper products, which normally make a one-way trip to the rubbish bin after their contents have been set aflame, are then meticulously cataloged and organized into handsome little books, transforming trash into art. Recently, Dotz tackled one of the most routinely discarded disposables, pet-food labels, particularly those from the 1950s, ’60s, and ’70s. 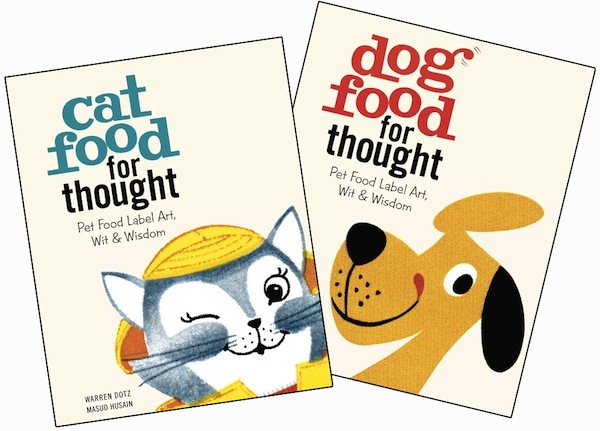 Titled “Cat Food for Thought” and “Dog Food for Thought” and published by Insight Editions, each 128-page volume contains 60 reproductions of pet-food labels on cans, boxes, and bags (the cat book also contains a number of sensational labels for cat litter and catnip). Each label is then paired with a saying, proverb, or quote about cats or dogs that relates to its imagery and text. 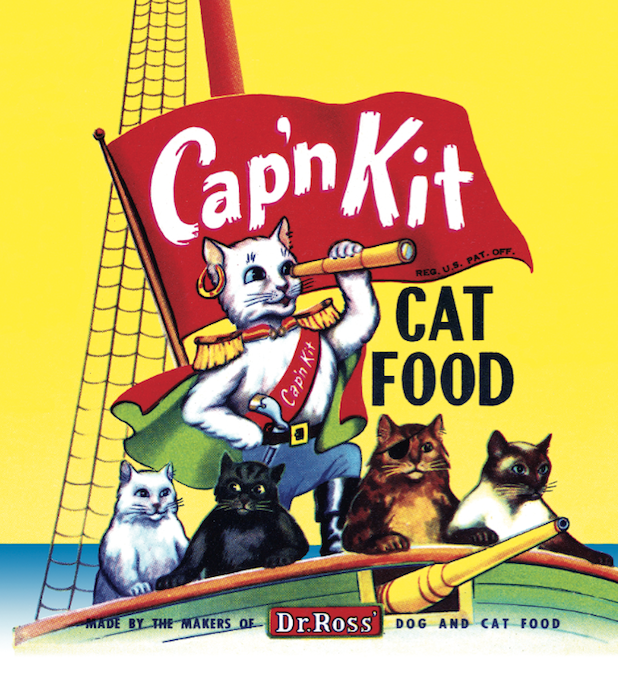 Above: Cap’n Kit, made by the Ross Food Company of Los Angeles, California. Top: Down Boy, made by The General Packing Company, Waynesville, Ohio. Their loss was his gain, but despite the quantity he had instantly amassed, Dotz still wasn’t sure he had enough really good material for a book. That led him to private dealers (Dotz says Robert Booth was especially helpful) and more auctions online. 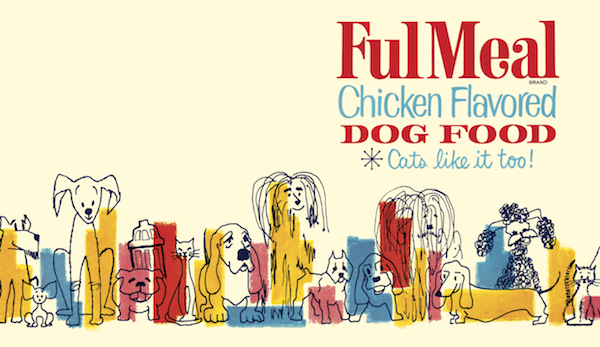 This Mid-Century Modern dog-food label was designed for a canned product packed by Plus Poultry, Siloam Springs, Arkansas. As Dotz began to assemble the images for the book with his designer and collaborator, Masud Husain, he learned about the history of pet food, which can be pegged to 1860, when an American named James Spratt noticed how fond English dogs were of the “ship’s biscuits” sailors tossed from their boats onto docks in Liverpool. Spratt hired a local British company to manufacture biscuits for dogs, which were made of wheat, beetroot, and vegetables, and bound together by the naturally congealing properties of beef blood. He called his biscuits “Spratt’s Patent Meal Fibrine Dog Cakes.” By 1870, Spratt had opened a branch in the United States (his company was finally purchased by General Mills in the 1950s). Until Spratt came along, dogs were fed kitchen scraps or, if their masters were wealthy, specially prepared ox-foot stew. Cats, meanwhile, who were kept largely for their ability to control the population of rats and mice on family farms, were often fed bowls of white bread soaked in warm milk, with fish for dinner if they were lucky. Some labels skew to realism, such as this one from General Mills, White Plains, New York. Of course the contents of pet food changed over the years, often rather opportunistically. After World War I, when cars and tractors took over city streets and country farms, horse meat became a prime ingredient in canned dog food. During World War II, when tin was rationed for the war effort, pet-food manufacturers switched to dried kibble sold in bags. 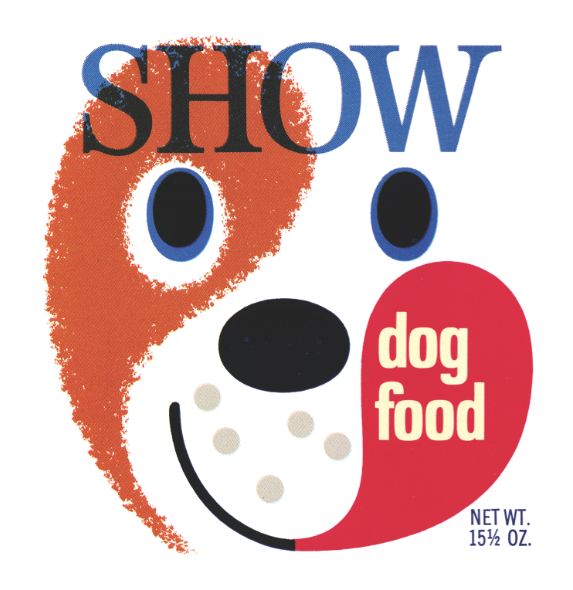 This label for Show dog food (the same brand name and style was used for the cat product) was produced by Purity Stores, Burlingame, California. 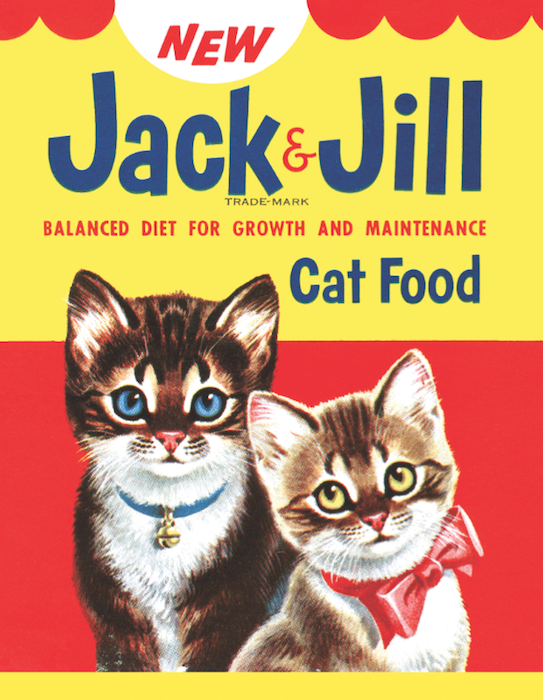 That’s why the images in Dotz’s book, which are organized by label name alphabetically, jump from realistic depictions of cats (Jack & Jill) and dogs (Fiesta) to ones that are highly graphical (Show was a regional brand, whose Saul Bass-like cat- and dog-food labels are almost identical). Somewhere in the middle are the labels that combine illustrated realism with the humor of cartoons—in the label for Cap’n Kit, one stern-looking tabby wears an eye patch, while the Cap’n himself sports a pirate’s earring. And then there are the labels whose characters are more purely cartoon, such as the gray kitty wearing a fisherman’s slicker selling “ALL-TUNA FISH” cat food for 9-Lives, or the happy yellow pup (known as Fido) on cans of Ken-L Ration, which introduced canned dog food to pet owners in 1922 to take advantage of all that suddenly available horse meat. Each book in the series features 60 images and as many quotes about cats or dogs, each of which relates to the image on the pet-food label. 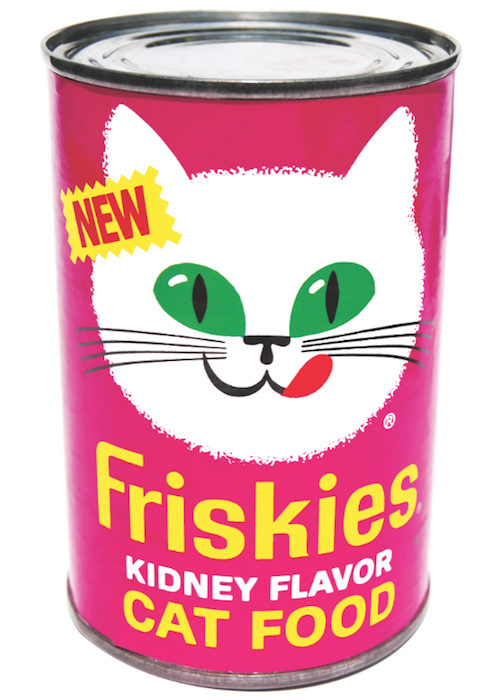 A Friskies label on its can: Notice the eye-catching green eyes and pink background, to differentiate the can on crowded supermarket shelves. 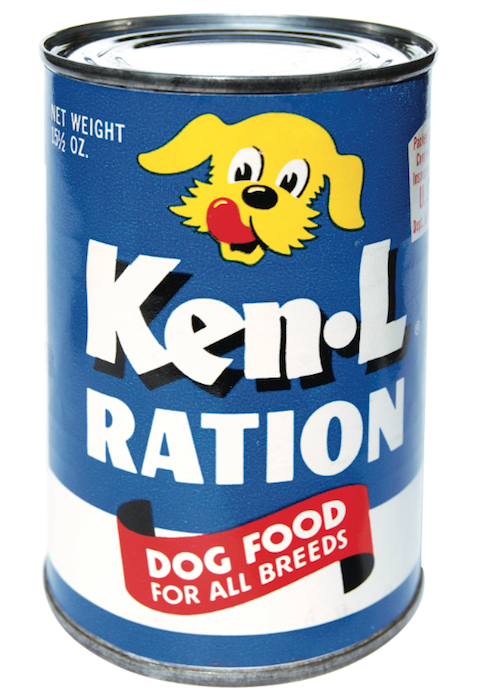 Ken-L Ration made the first canned dog food in 1922. 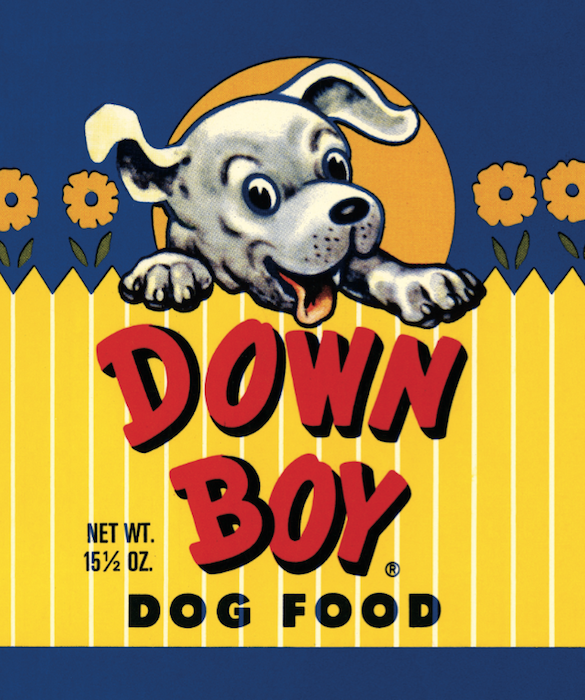 The yellow pup of undetermined breed on this can was known as Fido. 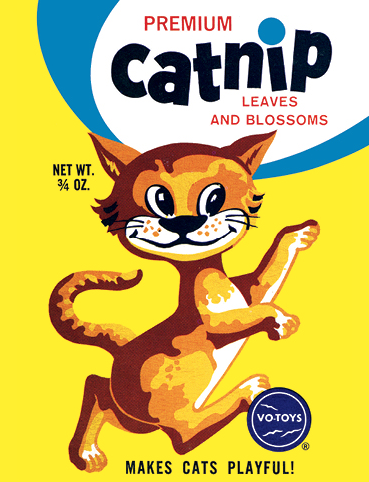 Even though the books focus on pet food, Dotz found a number of packages for catnip products, such as this one made by Vo Toys of Bronx, New York. 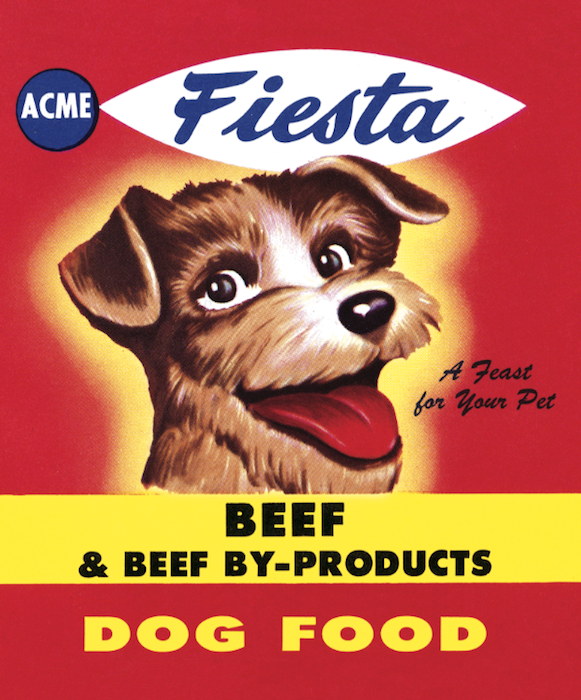 There was a time when labels could proclaim, without irony, that beef by-products represented "a feast for your pet," as in this label from American Stores Company, Philadelphia, Pennsylvania. 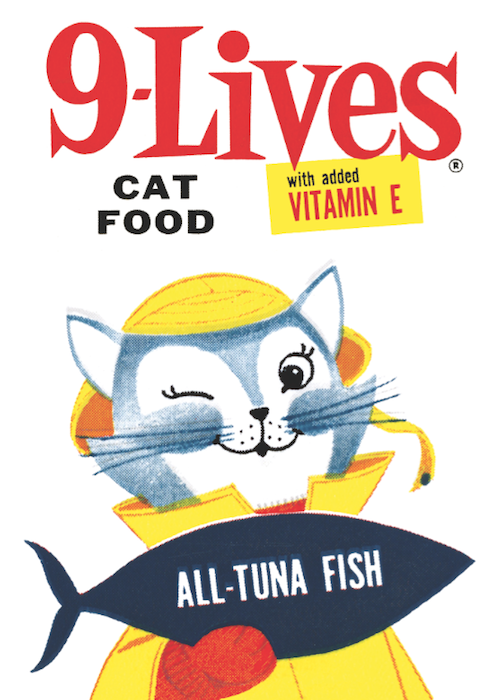 This 9-Lives label from the years when the brand was owned by the French Sardine Company of Terminal Island, California, predates the Morris the Cat era of the 1970s and later. Adding to the diversity of these labels was the postwar rise of suburbia and the resulting proliferation of thousands of regional grocery stores and perhaps hundreds of pet-food manufacturers, each one of which strove to differentiate its products from its competitors. This is not just idle speculation on Dotz’s part—he has proof. “ ” His design work has become the shorthand for the 1950s, which was not an easy thing to do.